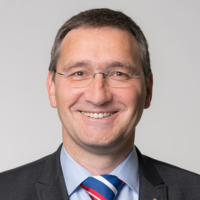 Since 2011 Dr. Andreas Wierse acts as Managing Director of SICOS BW GmbH, located in Stuttgart. The company was founded by the University of Stuttgart and the Karlsruhe Institute of Technology (KIT) to support small and medium sized enterprises in the uptake of smart data technology. From 2004 to 2011 he was shareholder and managing director of Visenso GmbH, Stuttgart, a company specialised in Virtual Reality (VR)-Solutions. Between 1997 and 2004 he had the same position at VirCinity GmbH, working amongst others in the development of the visualisation and VR software Covise. 2002 he received a doctor’s degree at Stuttgart University; he had finished his studies of Mathematics at Bonn University in 1991.